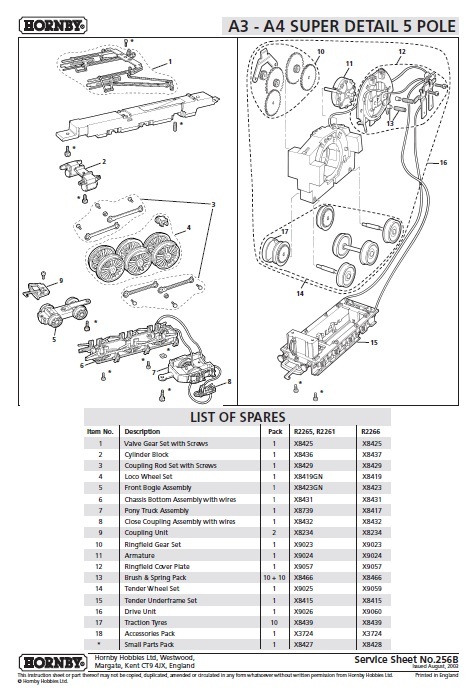 Every locomotive Hornby produce has a service sheet listing all the spare parts (see example below). We advise that before you purchase any spare that you check with your models service sheet to ensure you order the correct spare part. In some cases spares can be used to upgrade existing models for example changing a ringfield 3 pole armature to a 5 pole armature or fitting a DCC decoder socket to a non DCC ready loco. Note: If you require a Hornby spare not listed on our website please contact us for a quote. We do intend to stock an ever increasing range.